Uwe Rosler has made a very positive start to his Wigan Athletic career. Since his arrival good football has returned to Wigan and the future now looks much brighter. Rosler spent his formative years as a coach in Norway, where he learned the trade. However, it is at Brentford that he made a major impact. We reached out to Billy of the excellent Brentford fan site www.beesotted.co.uk to get his insight on Rosler’s time there. Thanks to him for this superb article. I remember exactly where I was when Wigan made an approach for Uwe Rosler. I was setting up the equipment at Hounslow Civic Centre for Beesotted fanzine’s first ever live YouTube video broadcast. It may sound like a dull show – a council planning meeting. But it was our new stadium decision and was possibly one of the most important events in the Brentford calendar this century. The news soon drifted around the room that Rosler was almost definitely out the door. Five hours later, the council had rubber-stamped Brentford’s move to a new stadium. There were cheers all around. Everything was finally beginning to go right for Brentford this season after a stuttering start. We were on a 9 match unbeaten streak – 8 of them being wins. We were well on the way to getting a new stadium. Many fans I spoke to that night tried to remain upbeat. But deep down there was a niggling worry that everything would fall apart now the manager was leaving. Personally, I thought Whelan could have held it down for at least another 24 or 48 hrs, negotiated with Brentford in private and given the club their night of victory and Uwe time to settle the team before an important FA Cup match. But he had to go public before the deal was done as obviously no one else matters. Should Rosler have gone? To be fair he had spent over two years living away from his family so a move closer to his home in Stockport was a no brainer really. We just had to accept and move on. Uwe Rosler was personally one of my top 3 favourite managers ever to manage Brentford. And that’s above Steve Coppell, who managed one of the best Brentford teams ever (Sidwell, Ingermarrson, Stephen Hunt, Owusu, Rowlands etc), and Phil ‘Noddy’ Holder, who was the last manager to have got us promoted to what is now the championship. Why was that? Rosler never actually won anything with Brentford. Rosler was very much a fans’ manager. He understood football fan culture and truly believed that fans were incredibly important to the game. He admired clubs like St Pauli as he felt they were a club who has great liaison with their supporters. He regularly held fans forums and even organised a pre-season friendlies in Germany encouraging fans to stay at the players’ hotel and hang with the players during the trip. When visiting Wembley for a Man City cup final, he decided to swap the glitz of Club Wembley with drinking with Man City fans in the Green Man pub before the match. He would often call our fanzine Beesotted to discuss issues and even volunteered to do a video interview for us after we had missed that final day penalty against Doncaster to help motivate the fans. And despite the wee spat he had with some Brentford fans during our dodgy spell at the beginning of this season when a small section of supporters sang “You’re gonna get sacked in the morning”, Uwe has had a brilliant rapport with the majority of supporters who saw him as being open, welcoming, honest and humble. 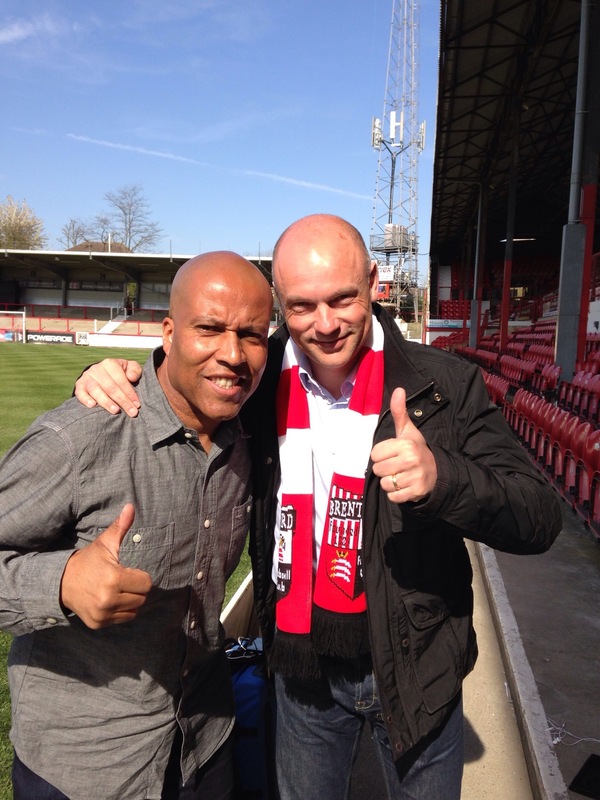 On the pitch, Rosler got Brentford to play some of the best football we have ever seen at Griffin Park. We’ve had some glorious moments under him. We were a mere 7 minutes from victory against West London neighbours Chelsea in a day out that many Brentford fans will remember for years to come. When Rosler arrived his catchphrase was “pass them to death” and that’s just what we did. We quite simply outplayed our opponents week after week – in some games we would have over 80% possession. He instilled a never-say-die spirit into the team which saw Brentford score a ridiculous amount of goals in the last minutes and injury time – Sheffield United away (with 9 men) , Portsmouth at home and Swindon away in the playoffs being three thrillers in which we scored last minute goals. And he orchestrated pre-season friendlies in and around Leipzig, Germany which will be talked about in Brentford for many a year – Brentford fans’ first foray into Europe since the Anglo Italian Cup in 1992. Uwe did have his detractors though. Although the majority of Brentford fans stuck with Uwe through thick and thin, there was a small minority who thought his tactics were often negative and he played too safe too often. His tactic of always having 11 men back to defend a corner frustrated some fans no end. And another thing that did frustrate folk was – despite often having the lions share of possession and creating 20 or 30 or even 40 chances per game – our goalscoring ratio was low, scoring at times one … or maybe two goals after creating a hatful of chances. There is an argument that if we had put away the numerous chances we had created, no one would be blaming Marcello Trotta for missing the penalty against Doncaster on the final day of the season as we would have long been promoted. All that aside, Wigan are lucky as they have got hold of a young ambitious manager who will have learned from his mistakes at Brentford. Hopefully, this will be to Wigan’s benefit. Uwe was always learning on his toes and realised after a season in Division one that ‘total football’ does not get you out of that division and we needed to have players and tactics that could mix and match between different styles. And so we did. He was brilliant at switching the game up. If we were looking poor in the first half, he would often change the tactics in the 2nd half and make a substitution that would completely change the game around. The counter argument to this was some believed that Uwe was too cautious in the first place and should have been taking the game to the opposition from the start. Uwe was also humble enough to acknowledge his mistakes. As a manager with a set plan, he would unsurprisingly try to stick with it and try and get the team to deliver his vision. When things were going wrong at the beginning of the season and Brentford were on a three match losing streak, Uwe decided to have a clear the air session with his players in the dressing room after a defeat away to lowly Stevenage. The players were locked in the dressing room for 90 minutes and apparently it was a real ‘air your dirty washing’ session. As a result of the meeting, Uwe then decided to switch to a fixed team week on week as opposed to the team rotation system that he favoured from when he had arrived. He also dropped ever-present and highly popular right back Logan for midfielder McCormack as apparently his defensive errors were raised in the meeting (as an attacking right back he was awesome). The result – Brentford won all nine subsequent games before Wigan poached him. All in all I wish Uwe well at Wigan. He will have learned from his mistakes at Griffin Park and will hopefully go on to make great strides. Our biggest fear is that he may try and take some of our young hopefuls with him – Adam Forshaw being the most likely to leave in the near future but we fear for losing Harlee Dean and Jake Bidwell too amongst others. Hopefully with him understanding the true meaning of loyalty, Uwe won’t leave us in the lurch. We would be gutted if any of our players left but if the inevitable happens, the least he can do is to sort us out with a decent fee and give us someone in exchange. I have no doubt that Uwe will not forget that Brentford’s owner Matthew Benham took a great risk in employing him from Norway as a left-field option when he was completely off the radar from clubs on their ‘manager hunt’. He put him firmly on the map by giving him time to develop as well as adequate finances to assemble a decent squad. And on the plus side, from Brentford’s end, things haven’t fallen apart. New manager Mark Warburton (who was in fact Uwe’s technical director and has been at the club even longer than Uwe) has won his first two games – both difficult ones at that against potential promotion rivals. We are continuing to play attractive football so Uwe Rosler’s legacy continues at Brentford. With any luck, Mark Warburton will finish off the job that Uwe Rosler came soooooo close to finishing last season come May this year. And finally, Brentford fans can lay to rest the ghost of constant failure that started way way back in 1985 at Wembley in the Leyland Daf Final against …… Oh ….. it was Wigan.